Starting in the summer of 2003, founding Papa String Band member Brett Mello started turning heads on the rocks of the Broad River with various friends. Many would gather ’round to listen to their new take on traditional bluegrass. The following spring, he formed a duo that started playing local bars and restaurants. The band expanded its lineup with the additions of bass player Gary Bishop; percussionist Jackson Wools; harmonica player Mike Fore; and Matt Fenech on the drum kit. The recent addition of LJ Errante on the mandolin and vocals has added another aspect to their sound. This combination of unconventional instrumentation allowed the band to push beyond traditional bluegrass, opening the doors for new experimentation and endless musical possibilities. The Papa String Band’s “signature blend” of music is infused with the influences of blues, jazz, psychedelic, funk, bluegrass, and jam resulting in the release of their debut self-titled full length CD of original music in October 2009. 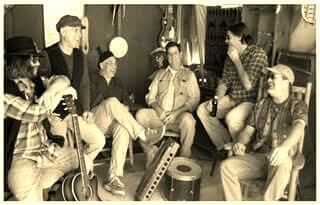 Papa String Band’s music has been described as “Americana”, “Jam”, and even “Southern Fried Grateful Dead”. Their live performances always include their own twist on covers of popular and more obscure songs, some blended together in long jams. Papa String simply calls their style “Funky Newgrass Honk”, music that captures all ages and leaves fans with smiles on their faces. The Papa String Band has evolved into an ever-changing, spontaneous, and unpredictable sensory experience, so “kick off your shoes, and hold on to your booze” cause the Papa String Band is coming to town!